Petra Kidd is a short story writer who is new to self-publishing but has already learned a great deal. She explains why marketing must be a constant focus of authors, why she doesn’t use KDP Select, and why she works hard to avoid spamming potential customers. The Eight of Swords takes you through Jayne Patchett’s thoughts and emotions when she arrives home to find a family of Romanian gypsies has taken over her house. It makes you wonder what you would do in the same situation. Her reactions might surprise you and you will be compelled to read on to find out what her actions are upon this discovery. It’s a short story but a big story! I had been studying the rise in e-publishing with interest for some time. The idea of having total control over the cover design, format and getting instant feedback particularly appealed to me. I am not a terribly patient person and I like to see results quickly. I wrote a couple of novel manuscripts around ten years ago and spent some time sending them out to agents only to receive rejections. Although I was keen to carry on writing, I’d just started a business and that took over my life so seeking a traditional publisher went by the wayside. In a way I am glad I didn’t have success at that time. With hindsight I can see how much my writing has improved and I have learned a lot over the past ten years. I wrote a weekly column for the Eastern Daily Press around five years ago and that was a real turning point for me. It was very encouraging to have such a large regional paper be prepared to pay me for my writing and it gave me confidence to continue. It’s very early days; I e-published The Eight of Swords on New Year’s Day 2012. I did enjoy the process of learning how to publish to Amazon Kindle and Smashwords and it was great having total control over the cover design. So far I have enjoyed every step of the way. I initially promoted the book through Twitter and Facebook. I set up an account back in July 2011 to build interest and encourage followers. By the time I was ready to publish there were a good number of people who were likely to see The Eight of Swords e-book up for sale. LinkedIn is another networking site I use as a promotion tool. I also placed a pay per click advertisement with Goodreads. So far I’ve had a number of clicks but no sales through it to the best of my knowledge. I do like the site however and will continue working at it to promote my books. This week I start a week long promotion with the Women’s Literary Café, I am looking forward to seeing how much interest that generates. Although I’m only a month into marketing The Eight of Swords, I would say Twitter and Facebook have given the best results so far. I am wary of the Amazon KDP Select program. I don’t like the idea of being exclusive to Amazon for 90 days or for the duration of the program. Also I am not sure about free promotion days. If I’ve had customers buy my book and then they see it on free promotion the next day I don’t see that as a good thing for obvious reasons. I understand many authors see it as a way to get lots of people reading their books in the hope they will come back and buy another title but like all authors, I work hard to produce my writing and think it’s fair to expect to be paid for it. E-books are low in price already, I think we have to be careful of not making readers expect too much for free or authors will struggle even more to make a living or not make a living at all. Also I won’t spam individuals via any social networking site. I think bombarding people with your book in that way, whether it is through direct messaging or other means, only puts people off completely. It may well work for some but it’s not the way I want to market. I try to interact with people and get to know them a bit rather than treat them coldly as potential customers and nothing else. I would like to be traditionally published at some point. E-publishing is still relatively new and I’d like to be able to reach people who aren’t keen on e-books or at least ready to try them yet. Constantly look for ways to tell people about your book. Explore every avenue of social networking and find out what works best for you. Try to do as much marketing as possible for free. Whatever you pay out comes straight off your profit, so spend wisely. Some authors don’t like the idea of having to market their books but without doing it you won’t get readers so try to enjoy the process as much as you can. 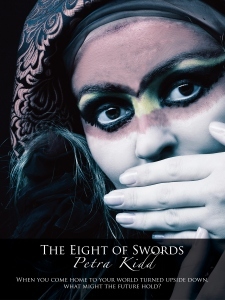 I have just completed The Putsi, which is the sequel to The Eight of Swords. The Putsi will be e-published in February. Please keep an eye on my blog for the release date. I am also rewriting one of the novels I wrote ten years ago, which has the working title of Fish. I hope to have this complete and ready for publication by the end of the year. Intriguing and compelling, designed to keep the reader hooked! Via my blog: petrakidd.com. Also feel free to contact me via Twitter @PetraKidd or my Facebook page. I completely understand her view on KDP Select. On the other hand, I just enrolled my book, Chasing Dolphins, in the program today. It’s only been published a week and I think for new authors it is a good way to build a readership when you’re just coming out of the starting gate. I wasn’t worried about the ninety day restriction on releasing the book on other sites because releasing a book anywhere and everywhere won’t do any good if you have no readers. Hi Lynn, thanks for your comment. I can certainly see why authors give KDP Select a go, certainly when releasing a book for the first time. I’ve read so many fors & againsts now it’s difficult to make any judgement on the system. Also it is early days so only time will tell. This time I just chose to build my readership through word of mouth, Twitter & Facebook. This doesn’t initially give the high numbers reported from some authors but I did want to try out Smashwords too to begin with. Like you I am brand new to this and finding my way, as are a lot of authors. Check out Rachel Abbott who is #1 at Amazon with her first book and achieved this within 3 months! This was without using KDP Select or any special promotion. It’s as much a lottery and comes down to how many people like your book and if they spread the good news. Also the work put into to constant promotion. Good luck with Chasing Dolphins, I wish you all the best!